Are you a local business in Calgary who is in need of a strategy to reach your local audience online?Do you need to discover the best marketing tactics for your business?Are you not finding any success on social media?Are you looking for a incredible way to connect with your local audience so they learn more about your business? We are marketing professionals and we created this amazingly easy and effective, free guide to provide you with social media solutions for your small business in Calgary! Social media has become a major part of our culture in the last 10 years, allowing people from all over the world to connect with each other through one medium. Social media sites like Facebook and Twitter began as a way for individuals to connect on a social level but they have emerged to become powerful connectors for people, companies and brands. 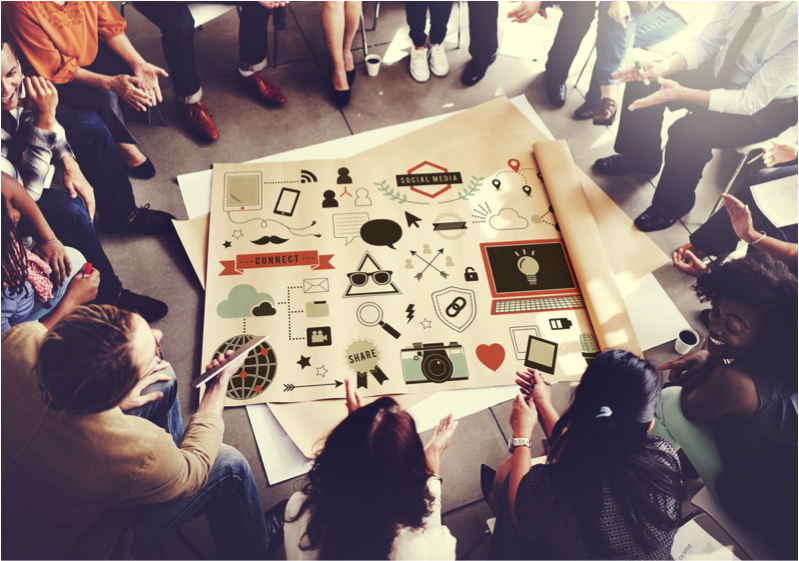 Social media gives companies a unique way to market to and relate to their customers, whether they are across the street or across the globe. Facebook gives small businesses a place to launch their digital marketing presence, grow their audiences and get to know their fans and create a loyal following. Social media marketing includes more than launching a page and waiting for people to find you. To really succeed on social media, you need to an actionable strategy that focuses on your goals. By the time you get to the end of this guide, you will know the exact steps you need to implement a custom social media marketing plan, and execute it so that you attract fans and grow your sales. This guide will show your Calgary business how to target the right audiences, get to know your ideal clients, reach prospective buyers and design great viral content so you can master the strategies to stand out online. This is the total guide for businesses who are getting started in the greater Calgary region,giving you the secrets of a successful social media presence,demonstrating the exact way to determine your potential buyers, compete with the local market and create a local presence. By selecting important elements like audience demographics and marketing tactics, you can create the best plan for your brand, whatever your objective. If you already have a social media strategy that is not working or if you are creating a new digital presence, this checklist will help you, showing you exact instructions so that you can use everything social media provides to you. 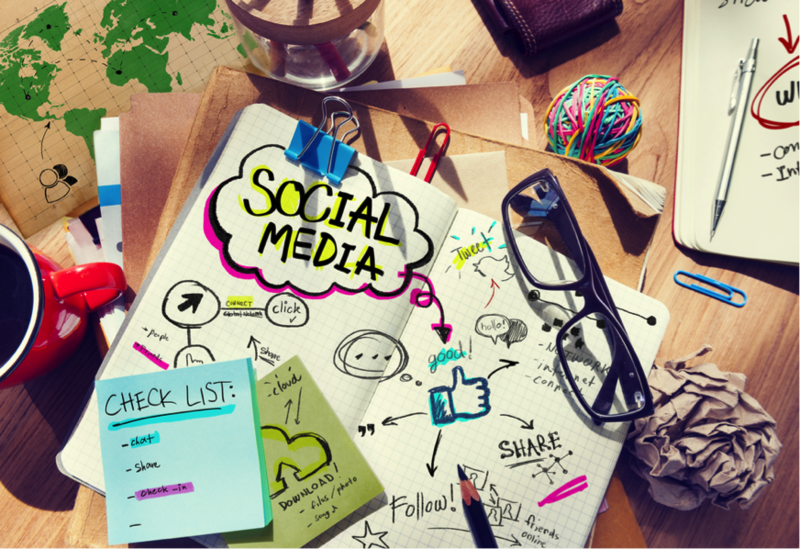 Ready for social media success? It starts here ! Download infographic and PDF workbook now. Fill out as you go along. You won’t be able to market your products without knowing who is in your market. There are many perfect markets out there and yours depends on your business, specifically what you provide, your location and how you want to reach your customers. Being a Calgary-based business, you will want to focus on the local Calgary area but exactly where you focus, which gender and what age ranges are choices you can make about your audience. Your ideal target market is influenced by your business’ products, services and unique selling methods. For example, if you sell your products online and ship to other regions, your geographic location will be larger than if you only sell in local Calgary. Consider where your buyers are located and center on the areas where you know you can sell and build an audience. A Toronto resident visiting Calgary will not be as valuable to you as your local residents so don’t spend much time, money or energy focusing on those individuals who aren’t local. Who are the people who regularly buy your products or services? If you are unsure of who these individuals are, it’s time to start measuring your market so you can better target them.For example, if you sell high end jewelry, your audience is probably adults, mostly women or couples. Perhaps a teen may purchase a bracelet on a special occasion, but its best to concentrate on people most likely to purchase, which is adults and women. Designed to be a tool for businesses, Facebook will give you handy tools that will make identifying your target market a breeze. You can choose to be narrow or wide in your targeting, but be sure to note your costs and returns; expanding your targeting to 100 miles from Calgary may seem like you can reach more people but you may not see enough sales to justify the increase in costs, especially if your store is local. You’ll want to target those who have the greatest potential to buy from you. For example, if you sell fashion sneakers, targeting to teens and young adults will be a better bet than selling to those over the age of 40. Think about gender as well; most women don’t need ties and men aren’t in the market for high heels. There is always going to be some exceptions and people will step outside their demographics but, honing in on your audience as much as you can will attract the right people and gain traction with the right audience. 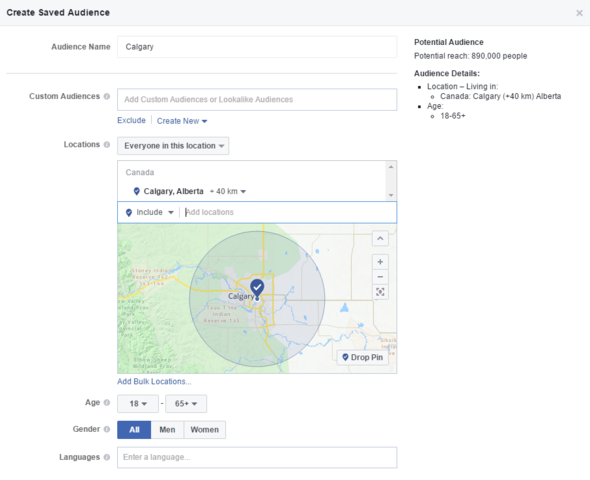 Facebook provides you with many choices to divide your audience for your advertising.In your ad manager screen, you can decide on the geographic location, kilometer radius, gender breakdown, age range and primary language you would like to target. On the right hand side of the page, Facebook will show you an estimate of how many people your ad will reach. You’ll want to find the right balance. If your targeting is too wide, let’s say, anyone within 100 miles from Calgary, and you may not get noticed, but if you are too precise, for example, men from age 12 to 18, you could exclude potential clients. To do this, you can just log onto your Facebook power editor, choose your advertising account, and then choose Audiences. 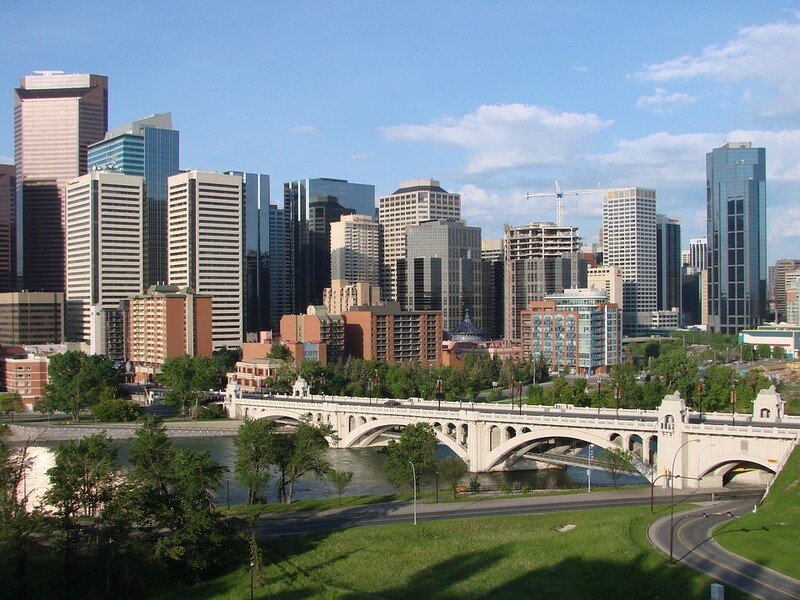 Then you can create your audience based on your ideal location, which would be Calgary and its surrounding region. Then we will begin to get more defined with your targeting. Location is not the only factor that goes into creating your audience. While it would be nice if everyone in Calgary was a potential customer, it’s unrealistic. A better idea would be to aim for the individuals who will probably become a regular customer. As well as location, age and gender, you can create targeting parameters such as page likes and demographics, to help you refine your audience to those who have the most possibility of becoming a customer. It’s not always exact since not everyone on social media will follow their favorite hobbies, celebrities and sports teams. 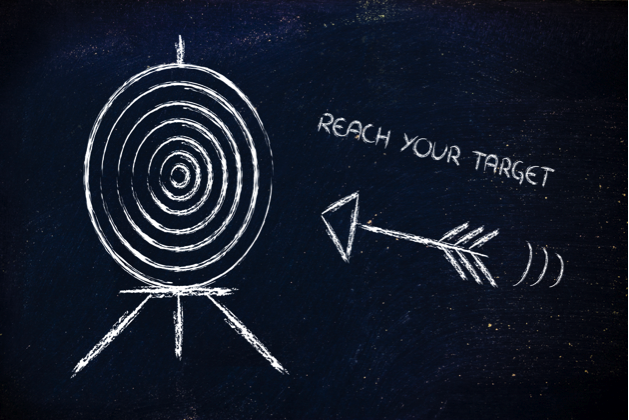 But this method can help you be more precise with your targeting. There are certain products and services that are do well when advertised to certain industries. For example, school supplies sell well when marketed to teachers. With this targeting field, you can make sure that the best customers see your ad and react to it. Now, customers can surprise you and come from a place you didn’t expect but it’s not best to bet on this method. Instead choose behaviors that reflect your audience, and you will increase your chances for success. Personal interests are very valuable to you for reaching your ideal audience with your ads. For example, if you sell camping equipment, you can target a more interested audience by targeting your ads to people who like fishing or hunting. When you do this, you get more bang for your buck by limiting who sees your ads to those most interested in your products. You don’t want to spend money on someone who doesn’t want your products or services. 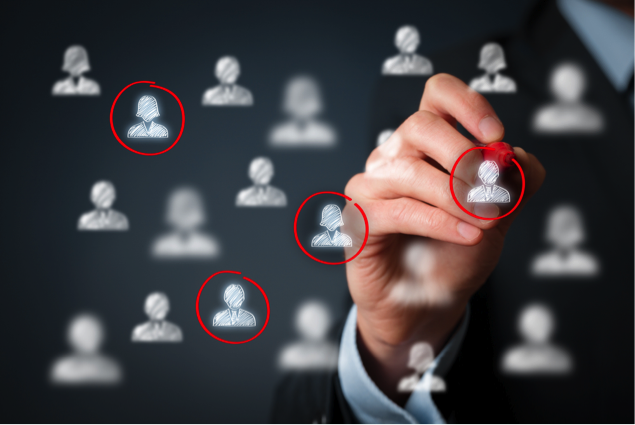 If you are unsure on how to more precisely define your targeting, consider the relationship between your business and certain interests. If you sell video games, you may want to target people who like certain gaming systems or specific games or brands that you sell. You can choose many behaviors or just one and experiment with it as what succeeds depends on your business. To do this in your Ad manager, go into your audience creation screen and scroll to the Detailed targeting features. 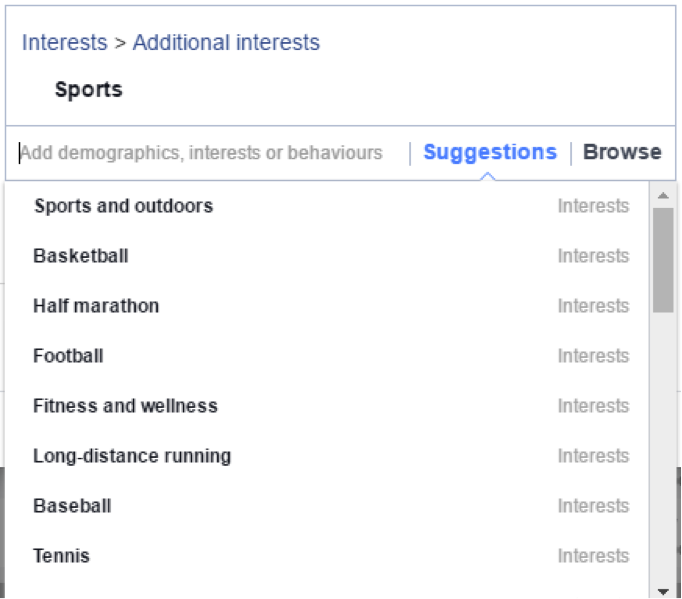 Based on these interests, Facebook will give you others topics that match it to help you with your search. 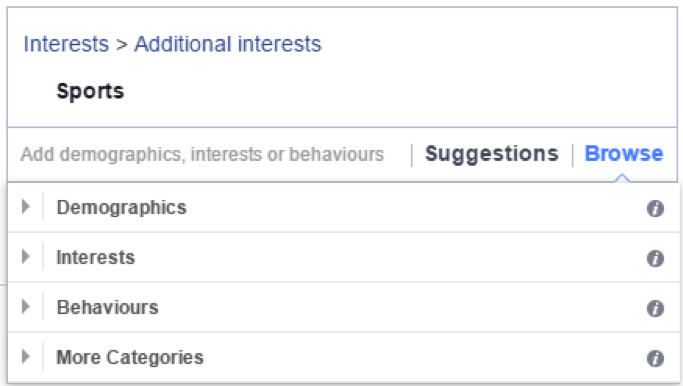 Another option is to click the browse button and find the top categories in Facebook. There are many combinations you can use when using the exclude function to find your ideal audience, which will only improve your ad’s relevancy. You now have your target audience in Calgary, along with their age, gender, interests, and careers. What’s the next step? At this point, you are going to determine what you are going to say.In writing great content, you want to ensure you are entertaining your audience and showing them the quality of your product or service. Just because your followers love jewelry, they might not always want only jewelry related content. Keeping this in mind, you will want to start creating content by getting clear on what else your audience likes. When you know the pages or interests your audience follows, you can customize your content and marketing around the topics your followers have already shown interest in. 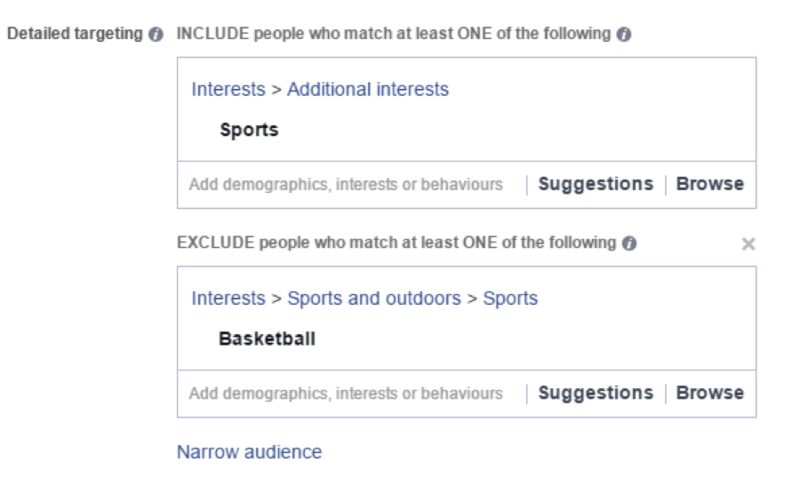 The Audience Insights feature on Facebook, which you can find under the tools drop down option in your advertising account, will help you with this. This unique tool shows you what the audience in your local area finds interesting, talk about, likes and follows. When you use the Audience Insights tool, you are able to put in factors or elements you are thinking of targeting, like the location, age, gender, interests, connections and pages to see the other pages, locations, and activities that are popular with those targeting parameters. You can play with different options and choices so you can see where groups intertwine or what choices are too specific. 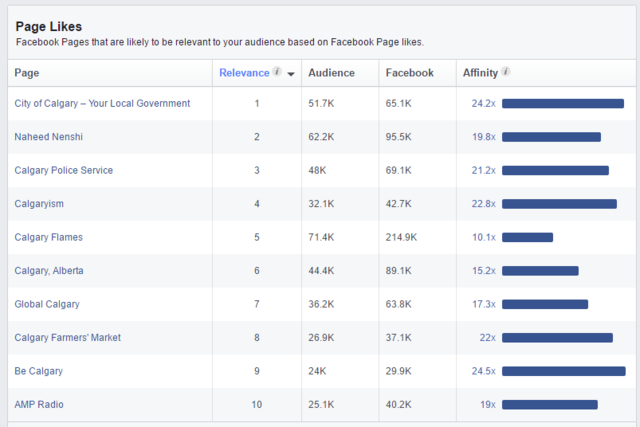 You can also the most popular liked pages in your audience with the Audience Insights tool. 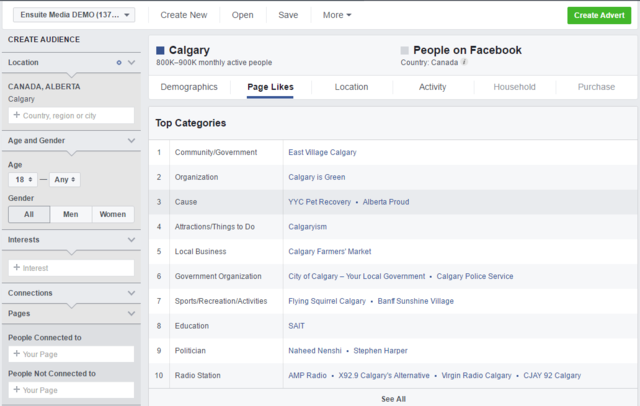 The example above shows adults of any gender in Calgary, a market of roughly 800 000 to 900,000 Facebook users, and among that market, Be Calgary,The City of Calgary, Calgaryism, The Calgary Farmer’s market and Global Calgary are mutually liked by the most people. This data will benefit you as you will see other interests,and overlapping services and topics that will get people to notice your posts. Without knowing your market, you won’t be able to lead it! Calgary is a popular area with many small businesses, and larger chains who are doing business with people who could become your customers. 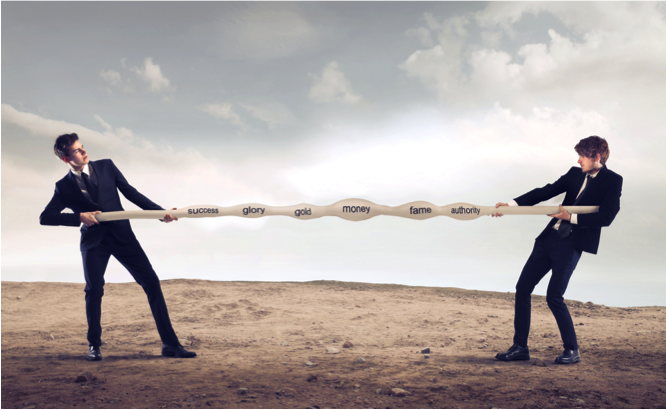 Being clear on who else is after your market, what they are doing in their marketing, the strategies they use, the content they promote and how you can be different is very useful so looking at your competition is beneficial for you. You’re in luck because competitive research no longer requires footwork and driving around town. There are many ways for Calgary businesses to research local businesses and access local directories to discover who else is in your market, competing for your customers. You can begin with the Calgary Chamber of Commerce. This database has information on all the local businesses in Calgary. You can easily search this directory by keyword or category to find out who else is in the area. The Calgary Business Directory is another resource you can use to search for other businesses. You can create a better plan when you are aware of who else is operating in your space. It’s important to not replicate what your competition is doing but by getting a grasp on what works in your industry will get you started. For instance, if your competitor is very successful with offering flash sales on social media, you might want to include some in your own promotions. It’s also helpful to know what the market is doing so you can do something different. If everyone is doing something one way, a great way to make a name for yourself is to go another way. This is why its extremely important to know your business and the strengths of your business. It’s only when you do that you can use your competition weaknesses against them. 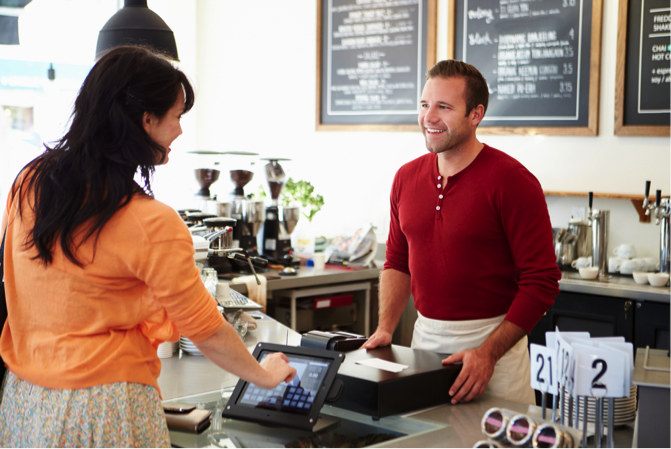 Since you are a local business, your hometown is important to you. Your customers will end up being your neighbors and living in your local area so being an active member and attending local events will be very important. Keeping an eye on what’s happening in Calgary will impact your success. Local events and foundations will present you with a way to give a name and face to your business and allow you to be seen as a proud member of the community. When you know what parades, festivals, and other local events are going on, you can adjust your marketing to have special promotions around them. Adding in local events to your content calendar and promoting them on social media, even if you’re not participating in them or going to them, will show your audience your love for Calgary. You can integrate local events with your marketing when you are aware of events going on in town and you can be a sponsor, set up booths and advertise on your Facebook page about what is happening in Calgary. It’s easy to stay up to date with what’s going on in Calgary when you know where to look. Calgary Downtown gives you a detailed look at all of the events in the area. You can view events weekly, monthly or you can search. You even add your own event to the calendar! com is a handy website that lets you know about parades, events, concerts, sporting events, entertainment and more happening in Calgary. You can filter by community or by month. EventBriteis the go-to place for events all over the internet. You can quickly search for events happening in Calgary and get all the information you need about upcoming event. Luckily, you don’t need to spend all day scanning community calendars. Instead you can just check in once a week and add any interesting events into your marketing calendar so your social media is up to date. Getting out the door and around the neighborhood? While you really don’t need to go to every event in Calgary, if you are going to be making an appearance, you should invite your followers to come as well! By holding specials, discounts or contests in person and promoting them on your Facebook page, you can connect your Facebook presence with your brick and mortar store and physical presence. Missing an event? That shouldn’t stop you from promoting it to your fans and supporting Calgary! A plan is essential for anything you do in business or onlineand it’s your next step to social media success. Social media may seem like a virtual playground when you first get started but don’t be fooled. Facebook can be an impressive business building tool if you use it correctly. With it, you can build your brand, attract customers and bring you more business online and off. If you want to see incredible results from social media marketing, the first thing you need to do is to design a plan. You need an all-encompassing goal for your social media, that will affect the way you use the many tools and strategies available to you. For example, if you want to grow your email list, your content needs to focus on this goal. You can develop your promotions, content, ads and strategies around this goal, giving it a clear focus and a clear way to measure it. You have to know what you want to achieve before you even try to log on to Facebook. When you have determined what you want to achieve, if that’s more sales, web traffic or followers, you will be able to take the lessons you have learned and apply them to your goal. 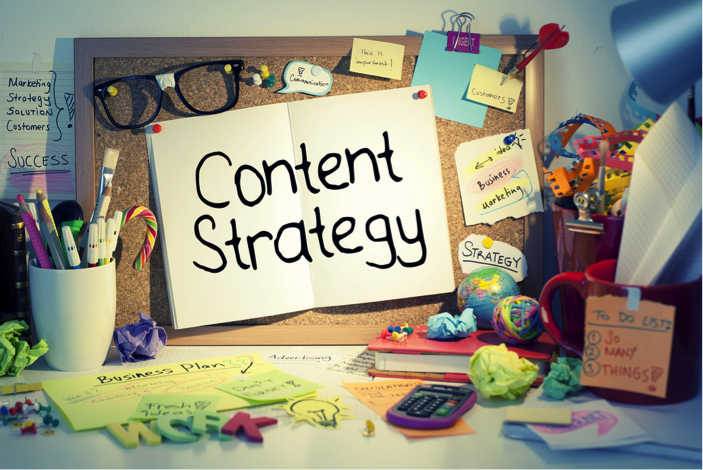 You’ll start creating your audience, writing content, promoting posts and advertising. When you are aware of how powerful social media is and how to use it, you can start creating your Facebook page that is focused on originality and audience connection. Getting started on Facebook can feel really stressful and difficult when you first begin but it’s work that is worth it.Using social media to promote your business is one of the best ways to grow your small business, giving you a budget-friendly tool that brings huge results. Facebook provides impactful tools, easy to use features and huge opportunity for results so that you can create amazing content, even with little experience. If you are not feeling that social media is something you can handle, relax because help is out there. 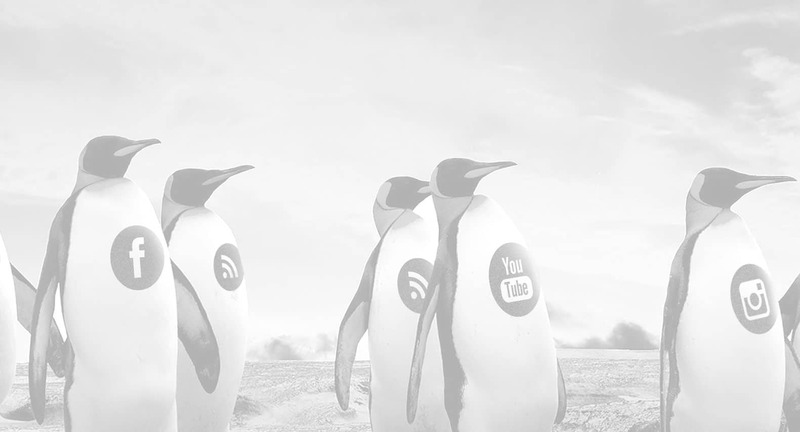 Working with an agency like Ensuite Media can give you the support you needto find your ideal audience, reach the right customers, create irresistible content and succeed with social media. If you have a goal, a plan and a willingness to learn, you can achieve incredible things on social media for your business in Calgary, boosting sales, widening your audience and strengthening your brand.